Custom Imprinted Solid Retro Sunglasses are classic folding eyewear which is ideal for promoting in outdoor events, parties and all kinds of celebrations. These custom sunglasses consist of UV400 protective lenses and they are presented in color choices such as Green, Blue, Lime Green, Gray, Red, Orange, Blue and Yellow. They have a total size of 6" H X 0.5" W and have an imprint area of 0.38" H x 1.50" W each side of these custom retro sunglasses. Order now to get free artwork design and free online proofs facilities! 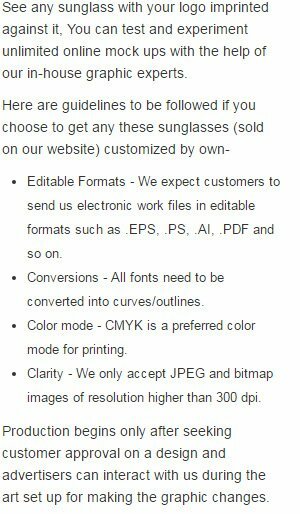 Request a quote to know what you can save on ordering Custom Imprinted Solid Retro Sunglasses. Available Colors: Blue, Green, Gray, Lime Green, Orange, Red, Royal Blue and Yellow. Additional Information: Classic folding eyewear. UV400 protective lenses.